The journal of Economics, Business, and Accountancy, Ventura (JEBAV) has its mission of being one of the leading journals in Economics, Business and Accountancy. JEBAV is a double blind peer-reviewed international journal with international members of editorial boards. The Journal has been published since 1999 with its ISSN, and in 2017, it was accredited by the Directorate of Higerh Education (Dikti), Jakarta, with its accreditation No: 51/E/KPT/2017. 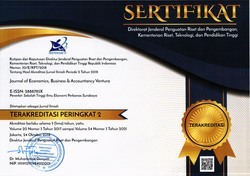 It has got its re-accreditation by ARJUNA via Menristekdikti in December 2017. It was formerly issued twice a year and since 2009 it has been issued quarterly, in (April-July), (August-November), and (December-March). This journal is published by The Research and Community Services at STIE Perbanas Surabaya, a college of business and banking, under the guidance of East Java Indonesia National Bank Association Foundation. The article submitted to this online journal will be peer-reviewed. The accepted research articles will be available online (free download) following the journal peer-reviewing process. Language used in this journal is English. 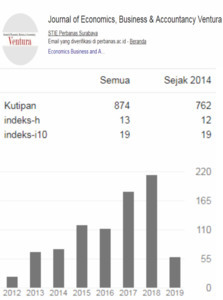 This journal has been indexed by SINTA, DOAJ, Google Scholar, Microsoft Academic, BASE, GARUDA, ISJD, Dimensions and all articles have DOI number. Rhetoric in sustainability report PT. Krakatau Steel (Persero) Tbk.